If you are like me, you worry about getting bitten by (insert giant biting bug here). Here in Indiana we get major mosquitos and even ticks and spiders. I’m sure it could be much worse, but it’s enough to be more than annoying here when you want to spend the evening outside. When I started using Young Living Essential Oils, I searched and searched for recipes of products I knew I would use most often and knew I wanted a 100% natural version of. No by products, no hidden synthetics, no harsh chemicals. One of the really cool things about essential oils is that they are pure, but still effective. Plus, you get to feel like you are a magic chemist putting all these “recipes” together. 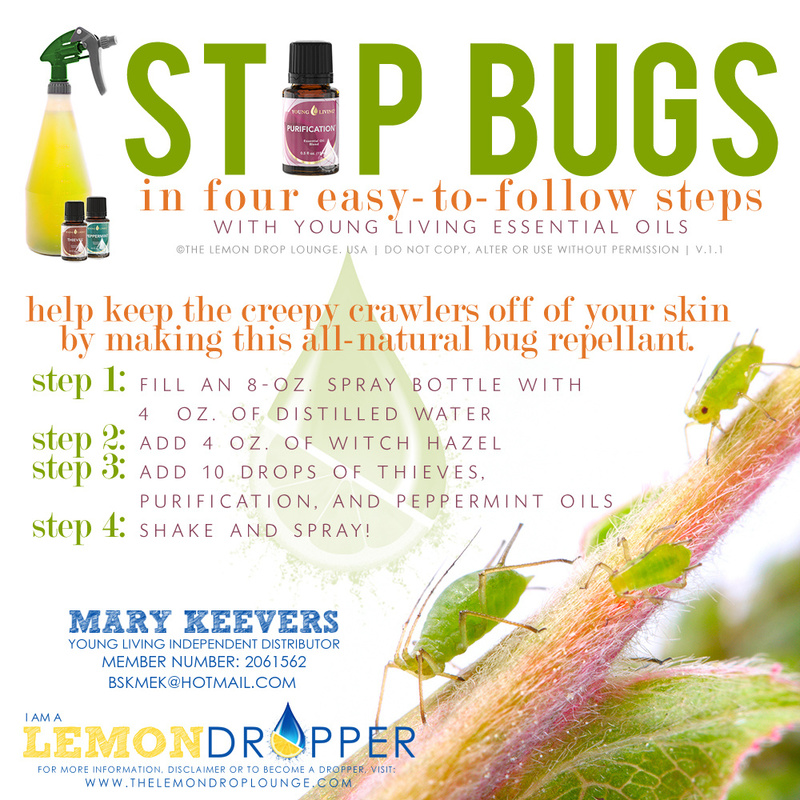 Today, I’m sharing the natural bug spray recipe from Young Living. Last night I wished I had this made up and ready to go when I was outside with our 6 year old playing and he was rolling in the grass. Normally I don’t care, but I saw mosquitos flying around. Tis the time of year for them to make their appearance again, after all. This recipe is super simple. Distilled water, witch hazel, peppermint, purification and thieves oil. Simple and super cheap to make! Another trick to repel bugs from around doors and windows? Put 10 drops citronella with 3 drops of peppermint on a cotton ball (or many cotton balls) and leave them around areas of your home where bugs seem to enter. 5 drops of lavender and 5 drops of citronella work as well. PS, I would love to hear your experiences with this recipe and others like it! Leave your comments below.